The Saint Jo boys hosted Prairie Valley on Friday for senior night. Like the first matchup, the Panthers were able to win, but unlike the first time, the Bulldogs were able to keep the game more competitive. Saint Jo won 57-50. Prairie Valley was able to break the Panthers press defense in the first quarter and knock down some three-point shots to go up early. Saint Jo was able to keep their pressure up and the Bulldogs shooting eventually cooled down. 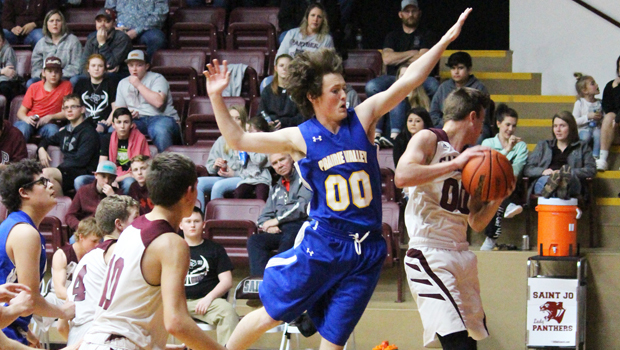 By the end, the Panthers proved too much for Prairie Valley athletically. For Saint Jo, Preston Lyons and Blake Anderson led them with 14 points apiece. Logan Morman joined them in double digits with 12.